The crowd waits impatiently, buzzing like a swarm of bees. He stands his guard, jittery inside but hiding it under a thin veneer of calm. The man on the other end runs, then throws. A graceful sweep, a flying arch in the air. His eyes follow it and he slowly smiles. And India goes berserk ! @Ritu – Thanks ! 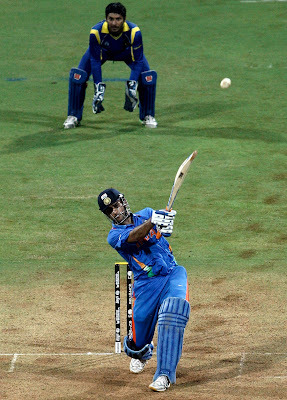 No the famous helicopter shot from Dhoni :) The last sixer that brought the cup home ! @Prateek – oh yes it was ! @alphabetworld- it was wasn't it ! it seems like you enjoy new writng challenges.